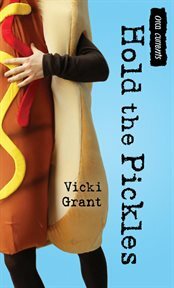 The item Hold the pickles, Vicki Grant, (electronic resource) represents a specific, individual, material embodiment of a distinct intellectual or artistic creation found in Austin Public Library. Dan Hogg is thrilled when his uncle offers him some work at a food fair, but his excitement vanishes when he learns that the job is dressing up in a hotdog costume and handing out samples. Every dark cloud has its lining, Dan discovers, when his mascot persona gains the attention of a pretty girl named Brooke.